Ready to Solve a Dice Puzzle? Solving a dice puzzle provides fun challenge and a little mental exercise for your brain. You can challenge yourself with jigsaw puzzles, wooden puzzles and even versions of the mythic Rubiks cube made from dice. Ready for some fun? I've found 3 different dice jigsaw puzzles and I'm on the look out for more. The first dice jigsaw puzzle depicts an abundance of multi-colored, 6 sided dice. It is a 1000 piece puzzle that should keep your brain working for quite some time. Puzzle number two also issues a 1000 piece challenge. It pictures a wealth of dice spilling out of jar, humorously called the Lucky Roll Jigsaw Puzzle. 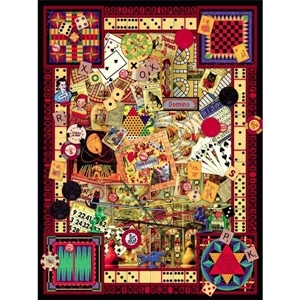 The 550 piece Winner Take All jigsaw puzzle blends in a variety of game pieces into the picture. Besides the dice, you'll also see dominoes, poker chips, scrabble tiles and more in the photo. Ravensburger Puzzle created a series of jigsaw puzzles based on the fashion designs of Ed Hardy. One of the puzzles, Love is a Gamble, features dice in the design! If you like to play jigsaw puzzles online, I've found an online dice jigsaw puzzle and also listed two free jigsaw puzzle games on my dice games online page. 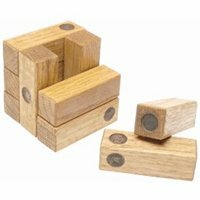 Wooden puzzles prove that low tech doesn't mean simple. 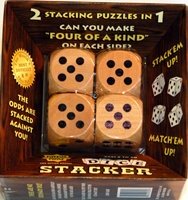 The dice stacker puzzle challenges you to stack 4 wooden dice so that all sides show four of a kind. The next wooden dice puzzle splits a large wooden die into 9 pieces. The goal is to assemble the 9 pieces into a cube again. The challenge is to do it so that the sum of the opposing sides equals 7 (1 opposite 6, 3 opposite 4, 2 opposite 5), just like real dice do. Here's a brainteaser puzzle inside a dice shaped box. Spill the contents, mix them up and try to put them all back in the box. If the above dice box puzzle is too easy for you, then you're ready for a new challenge. This dice box puzzle has a 4 star level of difficulty. The idea is the same: Put the contents back into the dice box so that they all fit. Good luck! I've found two variations on the Rubik's cube that involve dice. The first challenges you to re-arrange the metal plates inside the cube so that only white (not red) spots show on the sides of the die. Only one solution exists. Unfortunately, I have not seen this puzzle for sale anywhere currently. The next Rubik's variation is impressive. The cube itself is composed of magnetic dice that can be manipulated into different shapes or pulled apart into individual dice pieces. You can sometimes find these for sale on eBay. Go to the site and search using the keywords "rubiks cube with magnetic dice" or "dice puzzle" to see if any are listed for sale. You can also watch a You Tube video demonstration of the Rubik's cube with magnetic dice to get an idea of how it works.